Is there a better way to view listings on Craigslist.com? Yes! Is it easy to use? Yes! 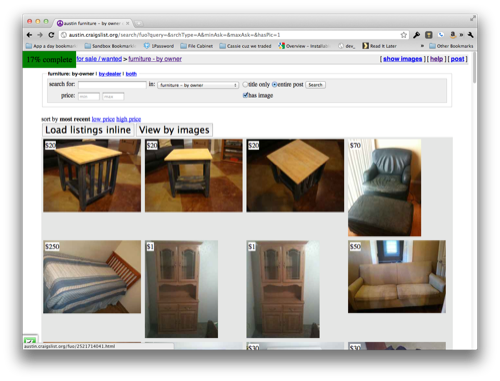 Today I released an update to my Craigslist inliner Kynetx app that I released some time ago. 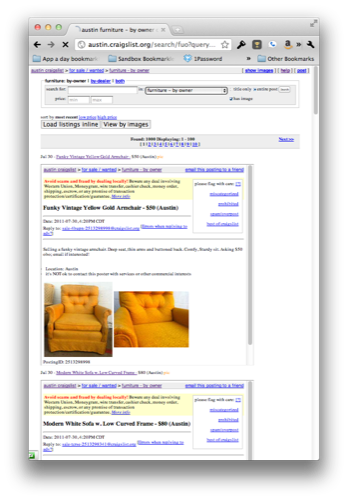 This new update allows anyone to view a page of craigslist posts by their images. If you have ever thought to yourself that you just want to view all of the images then here is your answer. The other viewing mode, for those who are curious, loads each listing “inline” in an i-frame so you can just scroll down through the page to view all of the listings.